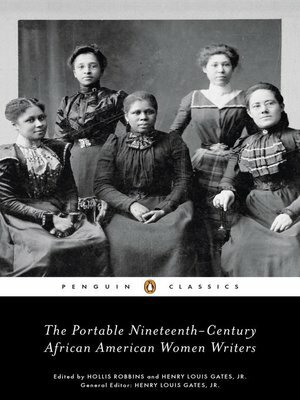 The Portable Nineteenth-Century African American Women Writers is the most comprehensive anthology of its kind: an extraordinary range of voices offering the expressions of African American women in print before, during, and after the Civil War. Edited by Hollis Robbins and Henry Louis Gates, Jr., this collection comprises work from forty-nine writers arranged into sections of memoir, poetry, and essays on feminism, education, and the legacy of African American women writers. Many of these pieces engage with social movements like abolition, women's suffrage, temperance, and civil rights, but the thematic center is the intellect and personal ambition of African American women. The diverse selection includes well-known writers like Sojourner Truth, Hannah Crafts, and Harriet Jacobs, as well as lesser-known writers like Ella Sheppard, who offers a firsthand account of life in the world-famous Fisk Jubilee Singers. Taken together, these incredible works insist that the writing of African American women writers be read, remembered, and addressed.